New Melones Lake level has dropped 2 ft. since June , currently at 1043.69 ft. and 44.31 ft. from full. Water temperature across the lake is equivalent to a cool swimming pool. With summer breaking out and the 4th of July week here, Glory Hole Sports will be open all week to keep you in tackle, baits and water toys! Celebrate Independence day and be safe. As the weather warms to full summer temps, the trout will go deeper searching cooler waters making it tougher for bank fishermen. Trollers are doing good, the top bait the last couple weeks have been using wedding rings, kastmasters and needlefish. 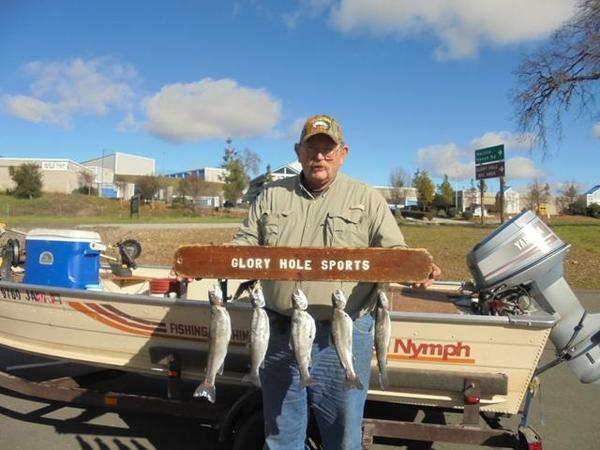 Angels Creek arm, main lake, and spillway are where you'll find trout. Cash Hilmanofski of Angels Camp landed this trout in 20 ft. of water using a Kastmaster in rainbow. The Kokanee are slamming the bait on New Melones with limits of the landlocked salmon being caught. Best time for the bite has been in the morning, tapering off later in the day. Jim Dirickson and crew of Angels Camp brought in nine Koks trolling 40 ft. of water on the main lake. Pink Hoochie, sling blade with a kokanee special scent was the go to for their outing. Bass on the lake seek shelter as we all do when it gets hot. Hit the lake early morning with your bait of choice, top water, jigs, or maybe some some drop shot. Fish all day, find some shady cove in the afternoon and you'll have plenty of bass to net. 8 year old Abby Radetich is prepping herself for the future pro circuit this next year landing this bass. This is what memories are made of... and she thought they were just fishn. Catfish are coming out at night. Drop a line with some cutbait, hang a bell on the end of your pole and go fish. Tuttletown coves and by the dam have been good places to fish cats. Pretty much anywhere there is shelter, shaded coves, structure, submerged trees, you'll find crappie. Ellery Stevenson of Fresno got on the lake early up Angels Creek Arm and had his game on landing a limit by 6:30 am. Ellery was using Crappie Jigs in pearl, white.